Dear friends and followers, a week ago an early christmas gift was delivered to my home! Boy was I happy when opening the package to find that it was the fourth and last release from Box Destillery in their series the "Early Days Collection". This whisky is a composition consisting of 76% matured in 130 litre bourbon casks, and 24% matured in 100 litre european oloroso sherry casks. 7% of the malt has been peated. Of course no chill-filtration and no coloring. The first thing that hits me is something really pear-y, like overripe pears soaked in whisky, then lots and lots of vanilla, yes very much vanilla! Then we have more fruits, such as banana or maybe something like the swedish candy ”skumbanan”. There is also something very citric, not really freshly squeezed lemonjuice but moving towards that. I also fin almond paste and/or marzipan covered in sugar-syrup. Finally I pick a wee touch of mint. I’d say that in all this dram kind of reminds me of a mix of Cardhu, Edradour and a quite young Highland Park (bourbon matured), so just a wee bit of peat in there. Judging by the nose, it seems kind of ”simple” in style, still I’ve been nosing for almost twenty minutes now so still a bit complex , if you know what I mean… Ok, let’s see what we have on the palate! Oooooh! Damn! Very salty, very peaty, A LOT more peat on the palate than on the nose! Almost in a bit of a chock here fellas! The peat and the salty-ness goes on for quite some time, say 5-7 seconds before it moves on in to a mix of gunpowder, quite dry herbs/something herbal and the almond paste (which I’d say has quite a central role in the taste profile). The early aftertaste starts to get quite pepper-y indeed, the salt won’t let go either. 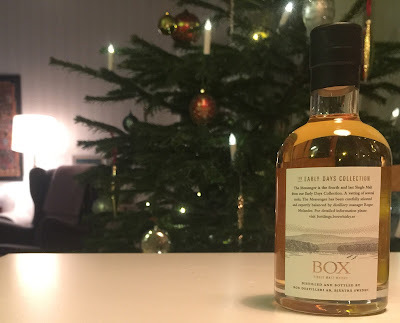 Then in the late aftertaste comes a big hand of vanilla and then in the very background are all the fruits, especially manifested by the banana candy… Wow, a quite powerful dram indeed, and the strength is absolutely perfect! 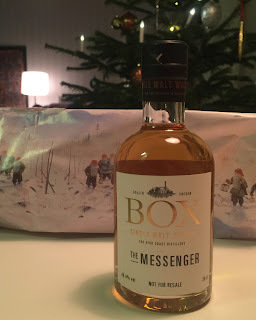 All in all it’s a bit of a cracker this dram, quite a quick one (in terms of how long all the flavours stay in the mouth), but still very impressive, definitely the best whisky from Box that I’ve had! Well done fellas and Sláinte to that! A big thanks to the nice people at Box Distillery for this very nice early christmas gift! A happy christmas to all friends and followers and please stay tuned to SamuelWhisky on my Zuckerberg-page by going here and to my bird-page by going here. Copyright © and All Rights Reserved on all tasting notes by SamuelWhisky and pictures likewise belong to SamuelWhisky unless stated. If you would like to use any such material that belongs to SamuelWhisky or associated with SamuelWhisky, please ask by sending me an email to samuelkarlssonorebro(at)gmail.com Sláinte!